09:34 pm - Vote swapping to prevent Conservative majority next election...you game? In a nutshell what it means is that if, for example, you usually vote NDP, but in your riding at this time the Liberals have a better chance of beating the Conservatives than the NDP, you vote for the Liberals to help ensure that at least the Conservatives don't win, and someone in a riding where the NDP has the best chance to beat the Conservatives will vote NDP for you even if he/she usually doesn't vote NDP. What does this signify? That our first-past-the-post democratic voting system is epic fail. It means it doesn't represent the peoples' opinions. It means our democracy is a bust, a sham and an illusion. Big surprise. So we have to devise our own plans to trick our own democratic process...wth. Well, at least people are uniting, if Conservatives form a majority government after the next elections I'm going to...I don't know, teach English abroad until they get voted out or something. [EDIT]: Not only do we have the elections to look forward to it looks like the stock market's riding their own rollercoaster. Yay. Truth be told I'm not surprised, what goes up must come down, and the economy's no different. 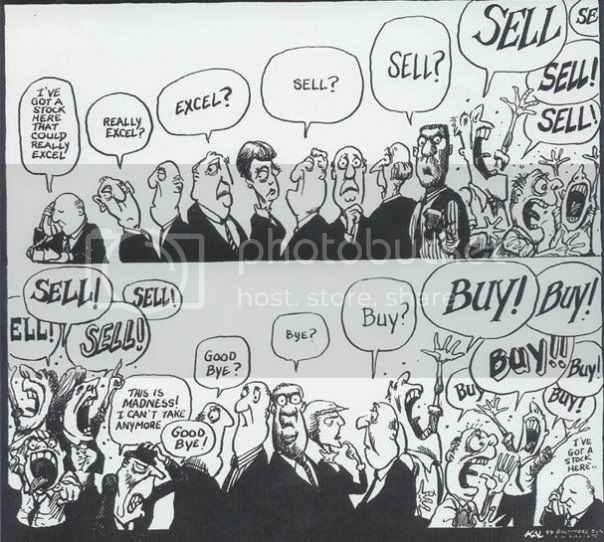 This whole trading, selling, buying empty transactions over the cyberspace is doomed to one day hit the brick wall. Never really understood the whole concept of the stock market on my end, to me it just looks like empty numbers getting tossed around. You can't eat stock, you can't touch it, you can't actually DO anything with it to help you survive. You know, if ever there's a world-wide computer crash morbid curiosity makes me want to be standing in the middle of Wall Street just to watch the panic that'd ensue.